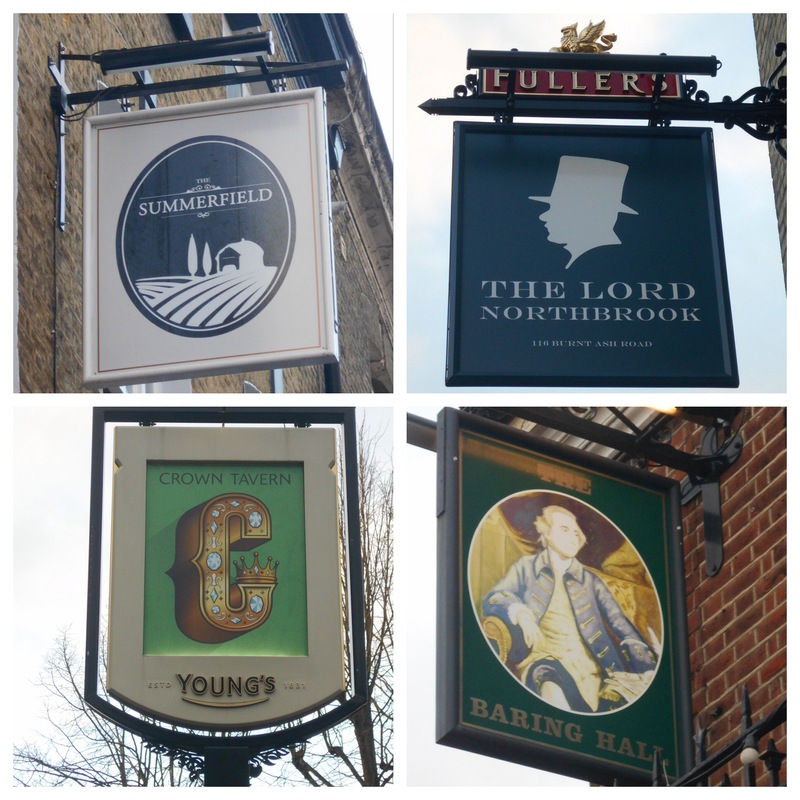 Running Past has covered several pubs that, for a variety of reasons, have been consigned to history – such as The Northover on the edge of the Downham Estate, the Plough and the Roebuck in Lewisham town centre, and Lee High Road’s Woodman and Prince Arthur. This post is somewhat different in that it covers a quartet of fine looking Victorian boozers that are still pulling pints for the residents of the southern part of Lee and Grove Park – the Crown, the Summerfield, the Northbrook and the Baring Hall at Grove Park. All are the work of one man – John Pound. As was covered in a previous post, Pound is, perhaps, better known as one of the major Victorian developers of Lee and Grove Park, along with some streets in Blackheath. It is clear that like James Watt a generation later, he understood that, in addition to building homes, money could be made from leisure activities built adjacent to the housing. For the non-conformist Watt though pubs would have been an anathema, he built cinemas and skating rinks instead. Pound was born in Blackheath in 1827. 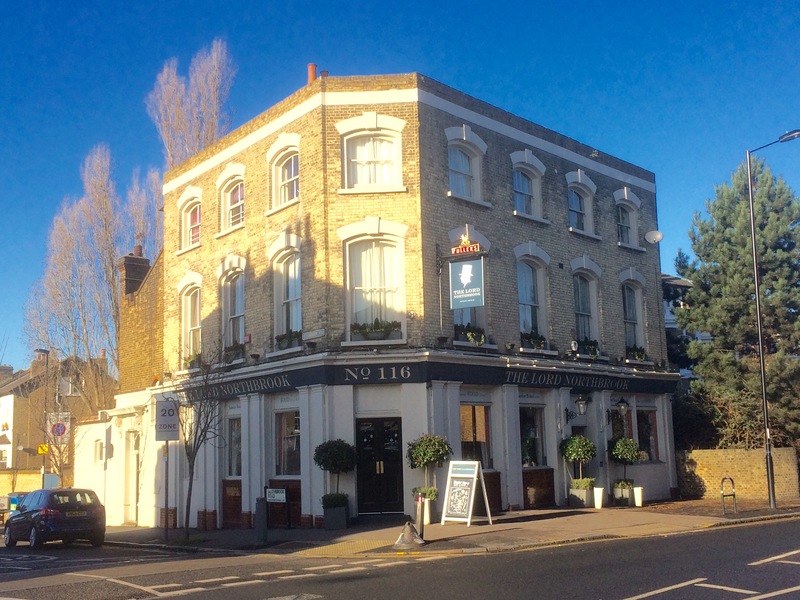 He was the son of publicans, Thomas and Sarah, who ran the Three Tuns pub (now O’Neill’s), above, in Tranquil Vale in Blackheath from 1824 (1). In the 1851 census he was living at the pub and listed by the enumerators as a joiner, as was his younger brother Richard. His older brother William took over the tenancy in 1853 on his father’s death (2) and seems to have stayed there until his own death in 1878. The current building post-dates the Pounds as it was rebuilt around 1885 (3). 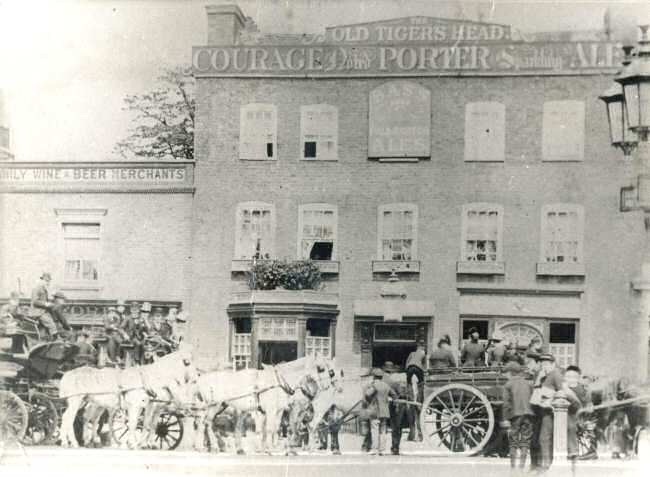 He married into the pub trade – his wife, Rose, was daughter of Caroline Morton who ran the (Old) Tiger’s Head at Lee Green above for over 2 decades in the mid 19th century, initially with her husband Charles, but for most of the time on her own after being widowed in 1844. John Pound was already a well established developer, living in Lee, by the time he built his first pub, the Lord Northbrook (above) in 1866 – named after the Lord of the Manor, and at the time the major landowner of the area. The family wealth as was covered in a post on Lee’s Manor House, was at least partially derived from slavery. The Northbrook is situated on the corner of Southbrook Road (Southbrook is a reference to part of the village of Micheldever, close to the Northbrook’s Hampshire house at Stratton Park). Pound whilst the first landlord, didn’t live on site, although his home was only a few doors away – roughly where Bellamys Citroen garage is currently sited. There were some grumbling by the licencing magistrates about him not living on-site when the licence was considered in 1866 – the pub was described as being part of a ‘flourishing neighbourhood’ (4). By the following August Arthur Bowker had become the licensee. The Summerfield (formerly Tavern), above, was named after the street which it stands on the corner of what is now Baring Road. Summerfield, as the name suggests, was a field pre-development – it may have originally been part of the land used by the Butterfield Dairy on the next street – originally Butterfield Street now Waite Davies Road. It is not absolutely certain that Pound built the Summerfield Tavern, although there is strong very strong circumstantial evidence to suggest that he did. He almost certainly developed the neighbouring Summerfield Street along with the terrace to the south of the pub on Baring Road. There were also mentions in the press describing the area to the south of the about to be built school on the then Bromley Road as ‘Pound’s Estate.’ The first licencee was his younger brother Richard from September 1870 with his sister-in-law Ann taking on the tenancy in 1874 after the death of her husband. She probably stayed there until around 1879/80 when landlord became a C Harding (5). The Crown (initially Hotel now Tavern) is located on what is now called Burnt Ash Hill, south of the South Circular, close to Winn Road. The link here to Pound is less certain but it is a pub generally attributed to him – if nothing more as the builder. 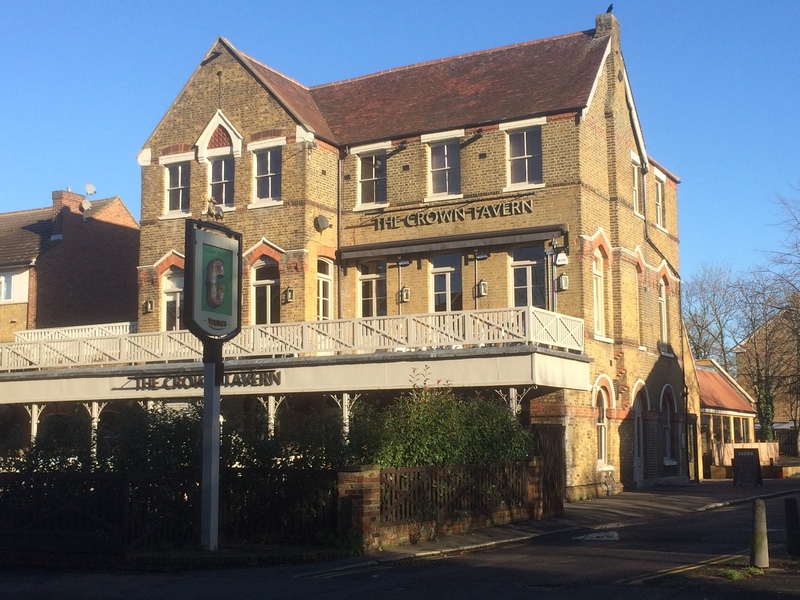 Unlike the other pubs covered, the land seems to have been in Crown ownership – a remnant of the former hunting lodges of Eltham Palace, covered in relation to Lee Green and Horn Park Farms. Neighbouring land had been used by Pound as brickfield from the 1850s until 1874 when the lease was sold (6). At this point there was already a beer house on the site – a licence to sell beer but not wine and spirits (this is explored more in the post on the New Tiger’s Head). There were references to the Crown Beer House from 1872 (7). The land seems to have been bought at the auction in 1874, or soon after, by William Winn. The current building was completed in 1878 and was a granted a full licence in the September session at the Green Man to the then licensee – James Playford (8). Winn was almost certainly the developer of the pub, and also developed the original houses in Corona, Guibal and Winn Road (see note from Pat below) and Pound probably the buider. The Baring Hall (above) was due to open around 1880 and Pound had applied for a licence on that basis, but it didn’t open until the autumn of the following year (9). Like the other pubs built by Pound, it is a lovely building, opposite Grove Park station. It was designed by local architect Ernest Newton who was also behind the listed Lochaber Hall, the original Church of the Good Shepherd and St Swithun’s Church on Hither Green Lane. Pound was to remain the landlord until 1886 (10) when it was transferred to William Basnett, who was already involved with running the business – he was mentioned in relation to a theft case from the Baring Hall in 1883 (11). The Baring Hall suffered a fire in the early 2000s and survived planning applications to demolish it in 2011 and 2012. The building is locally listed although English Heritage declined to give it a national listing and the degree of protection that goes with it in 2011, although was given the status Asset of Community Value (ACV) for 5 years from 2013. It was eventually re-opened as a pub by Antic in December 2014. 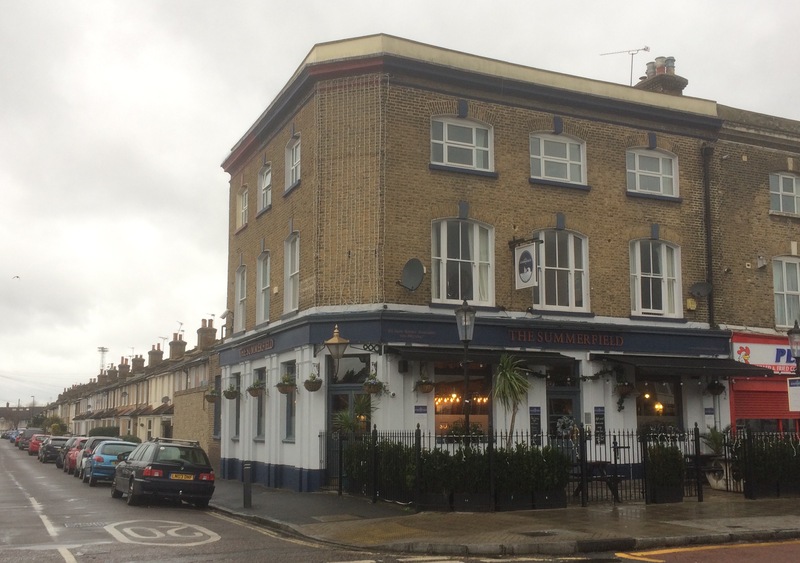 At the time of writing (January 2018), there is a campaign to extend the life of the ACV to ensure that it remains a pub. 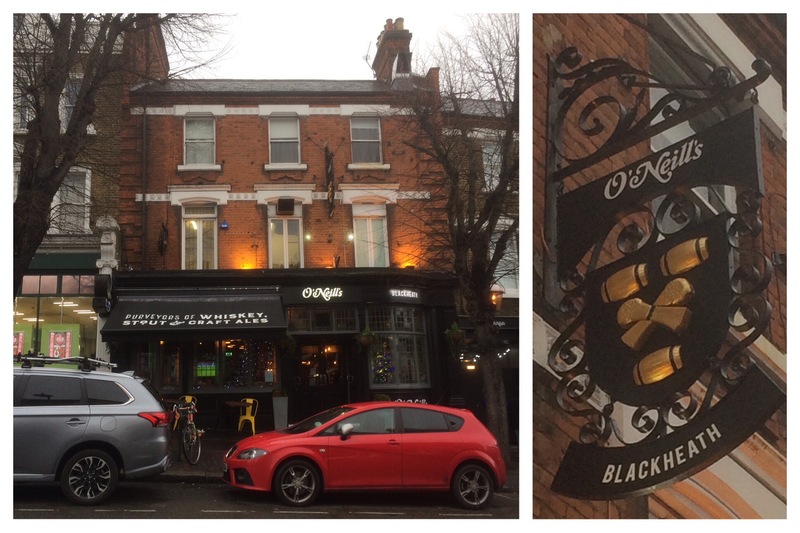 Unlike many of the pubs to the north and west Pound’s quartet have not succumbed to either the bulldozer or the developer, and from the outside at least, remain thriving, welcoming splendid looking pubs. In part, their longevity relates to the relative lack of competition that each of them has and has had in the past particularly those in Lee. – something at least partially controlled by one of the big landowners of the area – Lord Northbrook – whose family name remains in two of them – the Northbrook and the Baring Hall. Thank to Pat Chappelle, see comment below, for correcting me on The Crown and adding some interesting details on William Winn. 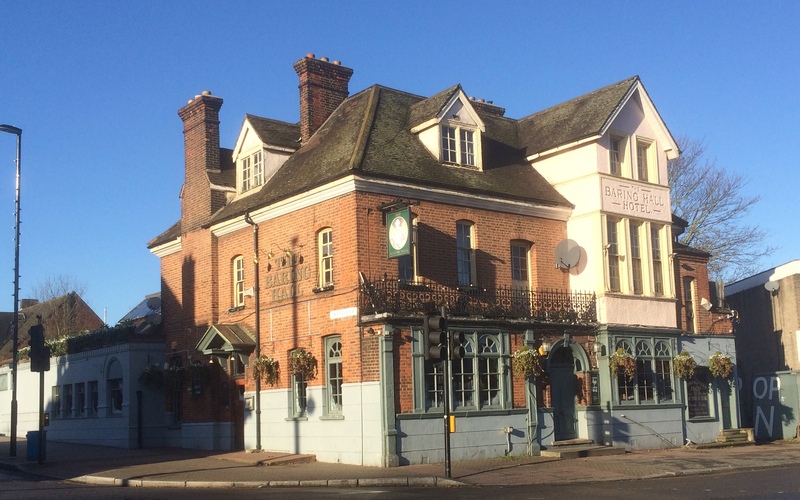 This entry was posted in Lewisham History and tagged Baring Hall, Crown Hotel, Crown Tavern, John Pound, Lord Northbrook, Summerfield Street, Summerfield Tavern, The Summerfield on January 31, 2018 by Paul B. Have to make another correction here. It was William Winn, not John Pound, who developed the Crown Hotel. I don’t have Ken White’s book in front of me to check that reference, but the two articles you quote from the Kentish Mercury relate not to the Crown but to the Baring Hall Hotel. James Playford ran the original Crown Beerhouse from around 1870, workers on the neighbouring brickfield being the ‘locals’. Winn acquired the land (from Burnt Ash Hill up to Mottingham Lane) and originally applied for a licence for a new premises in 1874 (KM 29.8.74) but this was rejected after objections. Once Winn made it clear that he wanted to build a (more upmarket) hotel, however, Playford was able (in 1878) to extend his beer licence to include spirits. Shortly thereafter (in 1880), Playford transferred the licence to John Scott and moved to Islington. The Winn Estate comprised Winn Road, Corona Road and Guibal Road. Throughout, Winn (a barge owner) lived in Bow in east London, although in the 1881 and 1891 censuses his wife Elizabeth, and just in 1881 their children, are found at ‘Corona Villa’ next door to the Crown. Enigmatically, in the latter record she gives her marital status as “widow”, although William remains on the electoral register until 1901. The origins of the names of Winn and Corona roads are obvious (the estate was on Crown land), but as for Guibal Road I can find no obvious origin and I’d be happy to hear if anyone has a clue, as that is the road I grew up on. Thank you! That’s interesting stuff about William Winn – it is a name that I was aware of but hadn’t traced to the East End, and still can’t see anything obvious with the rest of the family details correct. I tried unsuccessfully to link him to the William Winn who was, from memory, bailiff at Burnt Ash Farm for a while in the 1850s and early 1860s. The area you refer to around Winn Avenue was somewhere that I was going to return to at some point and do a post on. I know the Crown brickfield, along with some was sold around 1874 – so I assume that was to Winn. The link of Pound to The Crown came from the Grove Park Neighbourhood Plan – which I assume had picked up directly or indirectly from the expertise of John King. Certainly, I was probably looking for evidence linking to Pound to The Crown and there are a couple of newspaper references I have clearly attributed to the wrong pub. Maybe, the link to Pound is just as the builder? I assume that Winn was a developer, rather than a builder. With hindsight, I should have realised the links to the Crown Estate and Pound had a close link to the Northbrooks. By the way, Ken White’s book is silent on the early history – the first mention is Playford in 1879. I’ll amend the post at some stage over the next few weeks. Thank you for correcting me! Pound certainly owned the brickfield in the 1860s. The lease passed to Edgar Drewett circa 1867; he held it until 1871. It is unclear whether it then went directly to Winn, but he certainly held it by 1874. It is also unclear whether Winn employed his own workforce or contracted out the building. To save you the trouble, Joan Read is silent on Guibal. It’s rather frustrating when the derivations are lost like this. Another I’m lost on is Alice Thompson Close, the 1990s development at Sydenham Cottages off Marvels Lane.